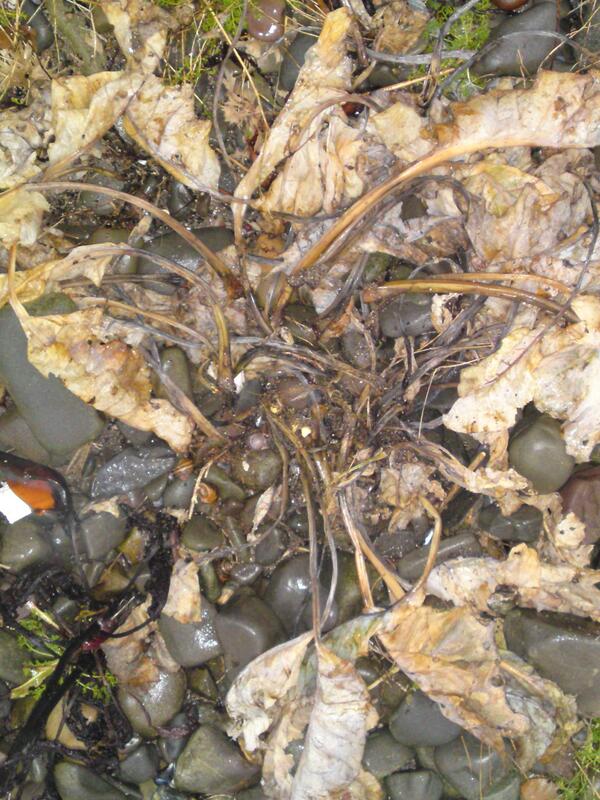 Edibility – 5/5 (1/5 – Roots, 5/5 – young leaves, 2/5 – old leaves, 5/5 – flower buds & heads, 4/5 – seed pods). One of the truly great wild foods. Identification – 4/5 – Hard to mistake. All stages, from the strange purple shoots through the large, thick, squeaky green/blue leaves to the honey-scented cruciferous white flowers and the pea-like seed pods, are pretty much unique in this habitat. Distribution – 2 – Occasionally locally abundant, but under some pressure in certain areas. Pick leaves, buds, flowers with consideration for the individual plant and the context within which it is growing. Be careful not to tread on the young purple shoots. Habitat – Shingle and coarsely sandy beaches, occasionally rocky shores, above the high tide line, very rarely spreading inland. 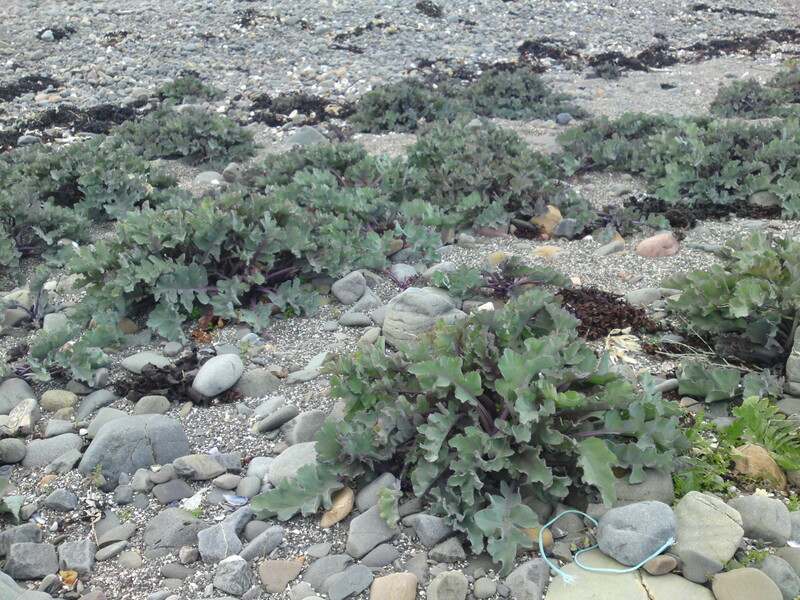 Even if it wasn’t edible sea kale would still be my favourite plant (well, maybe equal with common hogweed). Its alien-looking purple shoots, sculpturesque leaves and clouds of nodding flowers are works of high art to intoxicate the senses and marvel the mind. As luck would have it, it also happens to be absolutely delicious, providing some sort of food for most of the year. I place it on a par with ceps, reedman, hogweed and spoot clams in the parthenon of wild food gods. 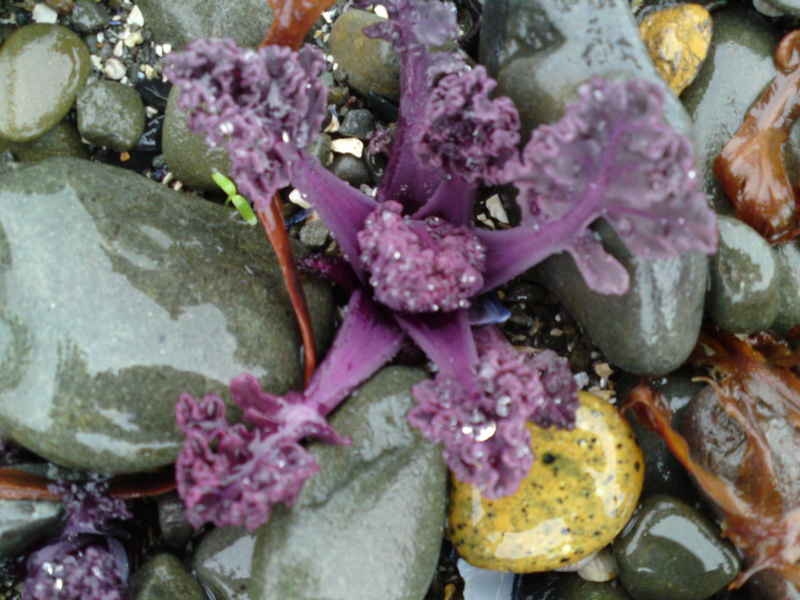 Young sea kale shoots, at their optimum size and condition for eating. Shoots like this can be gathered from among larger, less palatable leaves for most of the growing season. 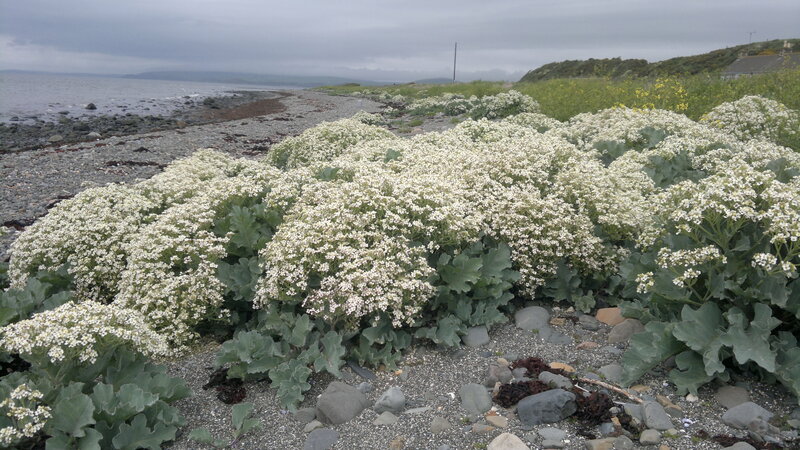 Apparently sea kale was once a common sight above the high tide mark on many of Britain’s shingle beaches, but is now restricted to sporadic colonies and clusters. This is due to a Victorian penchant for digging them up and transplanting them to ornamental gardens. As always, habitat loss is also an issue: the construction of sea defences has been the death-knell of many a colony. More often than not nowadays, the tramping of young shoots by careless walkers is their biggest threat. Considerate foraging of a few parts of each plant is unlikely to have much impact on the deep-rooted perennials. I am fortunate to live quite near a few large and well established colonies which keep me in delicious greens for most of spring and early summer. I know several sites with only one or two plants. Whether these are the beginnings of new colonies or the last vestiges of receding ones, I leave them to their rather wonderful business. 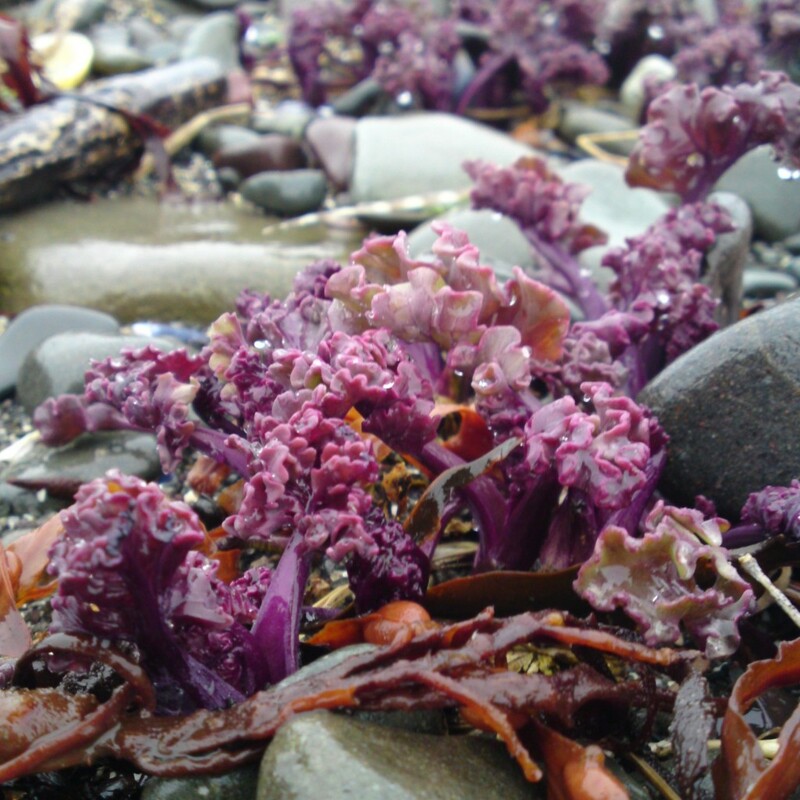 I hope everyone can experience and enjoy the sensual and gastronomic delights of sea kale, without impacting on its place in the world. I suspect that foragers will cherish and enjoy this plant so much, they are much more likely to contribute to its success and distribution than undermine it. 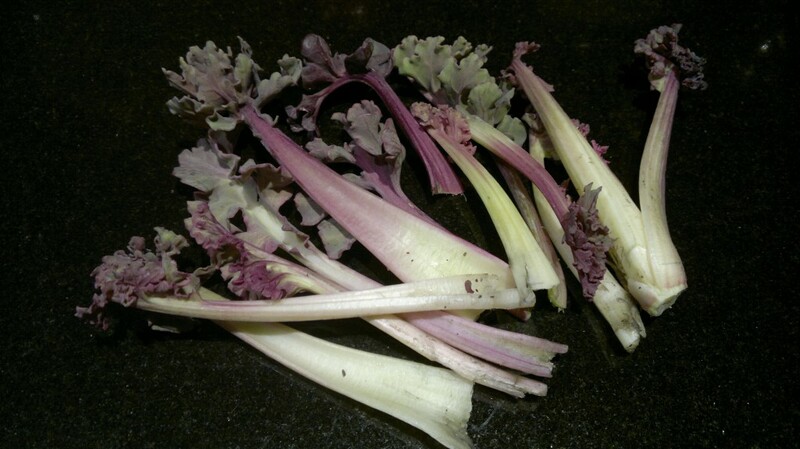 Sea kale is a native perennial, over wintering in a deep and extensive root system. All that is evident in winter is the top of the root and some large, dead leaves. The roots are edible, but apart from needing a JCB to get them up, it would be a crime (legally and metaphorically) to dig them up. I have read that hey don’t have much culinary merit anyway. During February the first signs of life start to appear, with deep purple shoots emerging from the woody root-tops. By mid March, striking deep purple coral-like shoots will develop. At this stage the leaves are succulent, crisp and tender, with a sharp cabbagy pepperiness and make an amazing centrepiece to any salad. 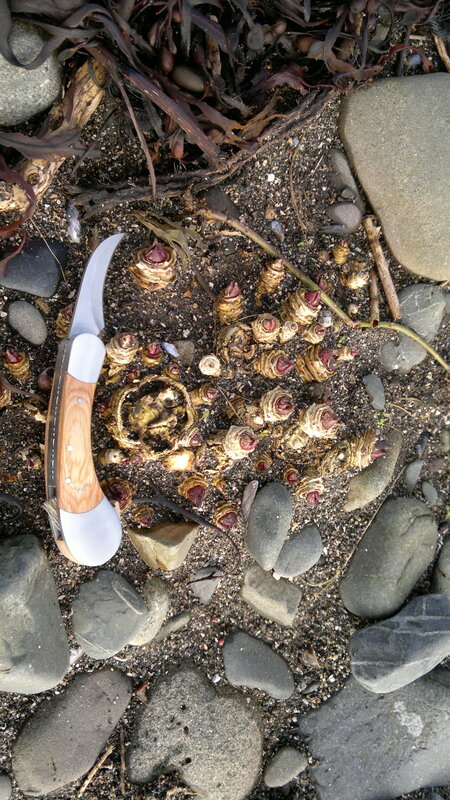 If you are tempted to try a couple at this stage, resist and completely bury the shoots in shingle. If you return in a few weeks time, the shoots will have forced their way up and yield lovely long stems that can be cooked like asparagus. By mid April the earlier weirdness will be starting to resemble something rather more cabbagy, with the leaves thickening and taking on more green hues. Leaf colour can be quite variable between two neighbouring plants – anything from a pale, washed-out looking greeny blue, to rich greens and purples. 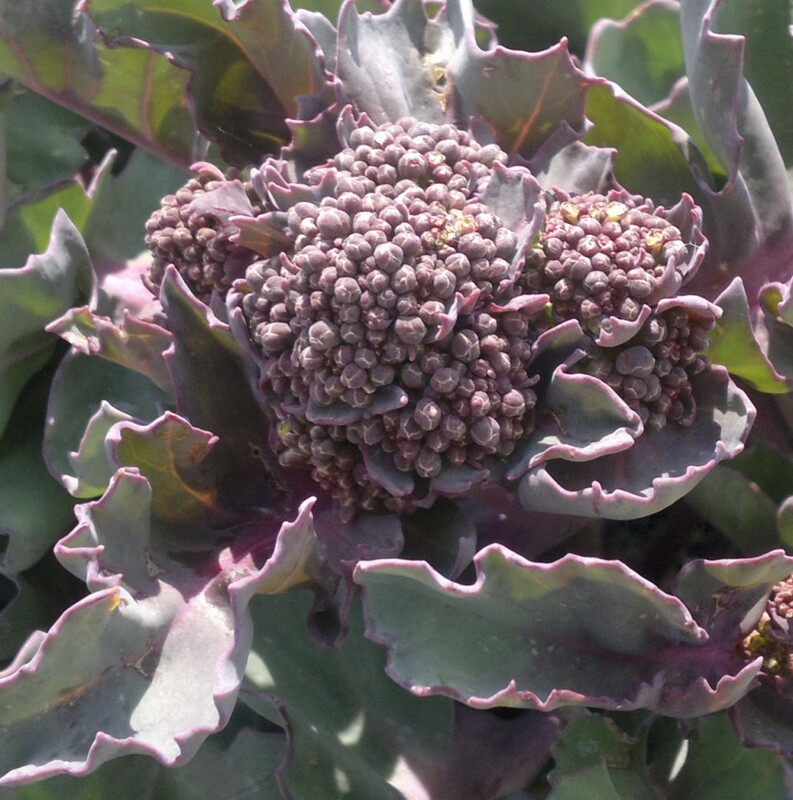 Flower heads are starting to form by now, and before opening they knock the spots off purple sprouting broccoli in every department! 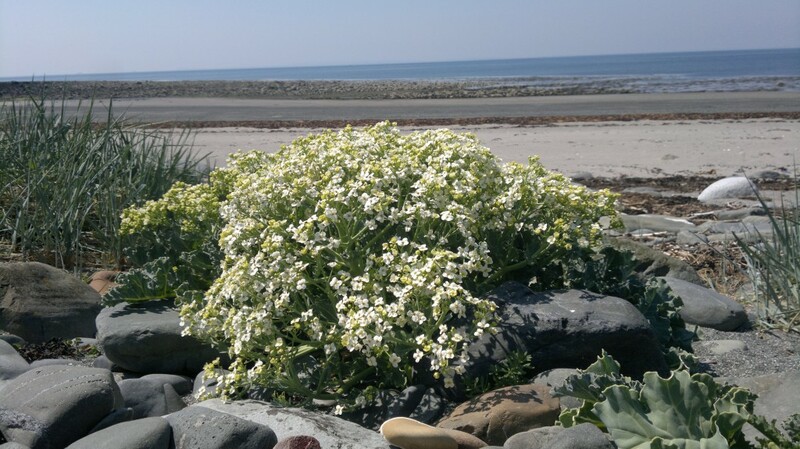 By mid-May, most of the flower heads should have opened out into fabulous crowns of small white flowers and if you are among a large colony, you will be intoxicated by the honied scent of the blossoms. They taste as good as they smell and make a striking and delicious accompaniment to meat and fish. The stems taste mildly of pea and cabbage which combines remarkably well with the sweetness of the blossom. I have seen seasoned michelin starred chefs get as giddy as a child in a sweetie shop when introduced to this for the first time! The leaves by now will be getting large and thick, but you should still be able to find young, tender ones if you delve through the foliage. By summer, some of the leaves may be a much as 2 feet long by which time they will have become tough, bitter and in need of a lot of cooking if you plan to eat them. I have had success cutting them into long ribbons and cooking like tagliatelle. 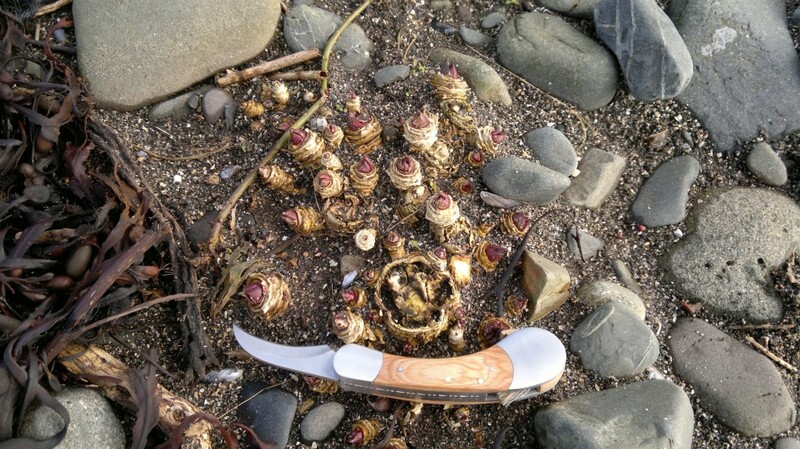 A word of warning here though: my wife and I once ate a delicious fully-foraged meal of Wigtown Bay sea bass stuffed with sorrel and sweet ciceley served on a bed of mature sea kale leaf tagliatelle. 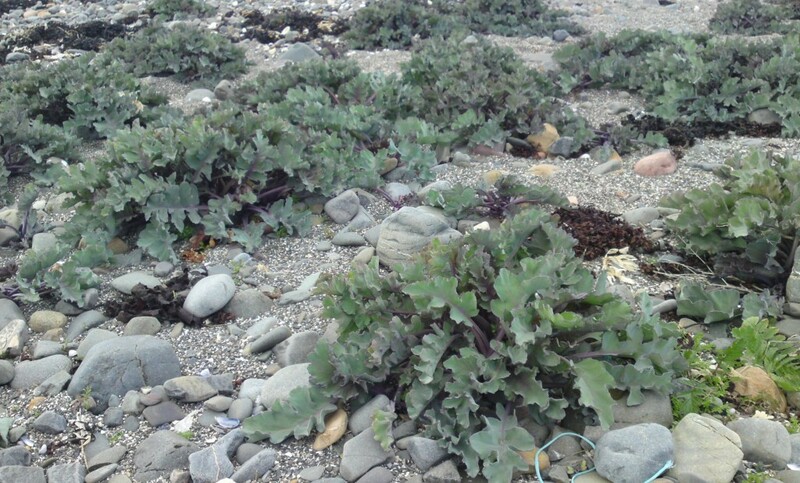 It left both of us at a rapid rate of knots in liquid form exactly 30 minutes later and sea kale was the most likely culprit! I should add that there were absolutely no other ill effects, it simply left us feeling light and purged. I’m sure there are Hollywood starlets that would pay a lot for such an ingredient! As summer gets going, strange round translucent green fruits appear. 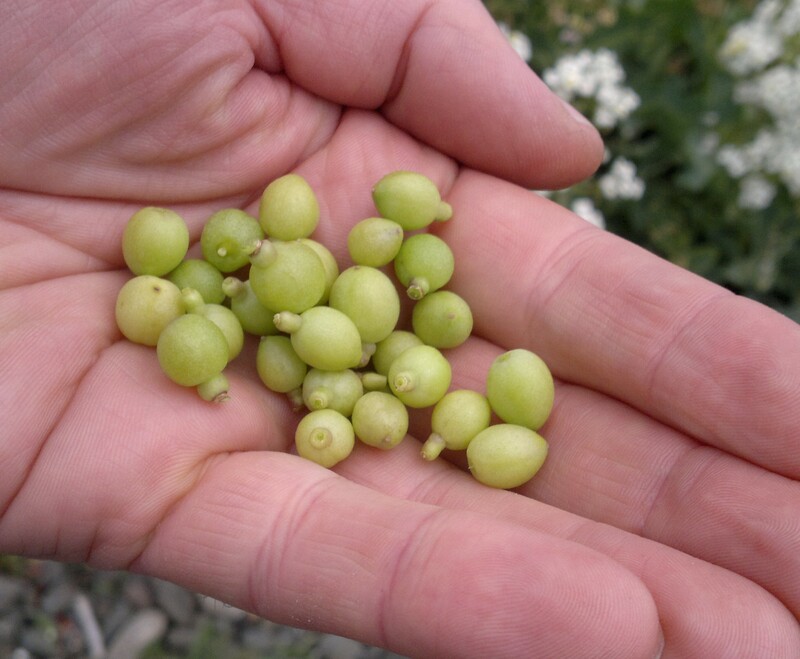 They look like peas and taste like cabbage and are the final wonderful twist in the life-cycle of this remarkable plant before it dies back to escape the winter storms. Really interesting, thank you. I’m enjoying learning more about the wild flora on Suffolk vegetative shingle at the moment and have seen Sea Kale and Sea Pea. Do you eat the latter too? Thanks. I eat some vetches (see wild plant guide), but not sea pea. Many in this family are only marginally edible, after extensive prep. Though I am yet to fully explore possibilities. 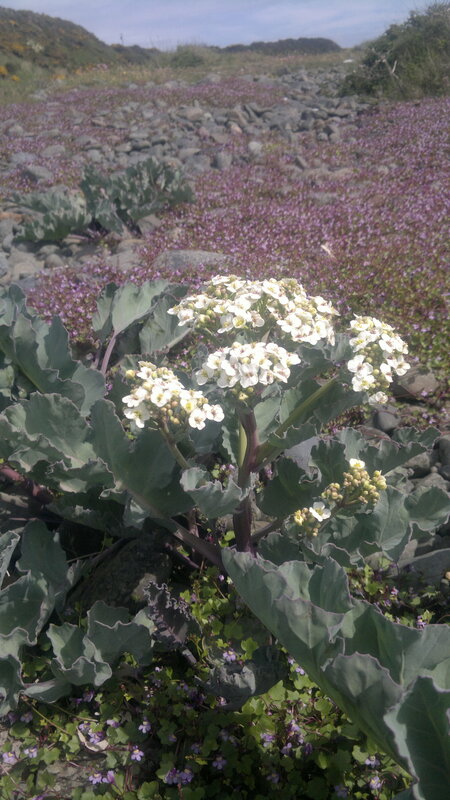 I first saw this triffid of a plant in the wild about 10 years ago by a seaside car park where sand dunes meet man made shale (its a long story) when it developed its wonderful budding flower heads I decided it was a broccoli plant escaped from near-by fields. I nibbled a raw bit and WOW broccoli was never this good… I realised what it must be and looked it up to be sure, but this was the only plant I could find so I wouldn’t harvest from it. Over the next two autumns I gathered the seeds and spread them along a mile and half of coast where they have now taken off and are happily spreading themselves. Did you know that The victorians would earth up around them to get blanched stalks for eating, the shale often does this naturally. Great to hear that you’ve met and got to know this lovely plant. Good work in helping it along. 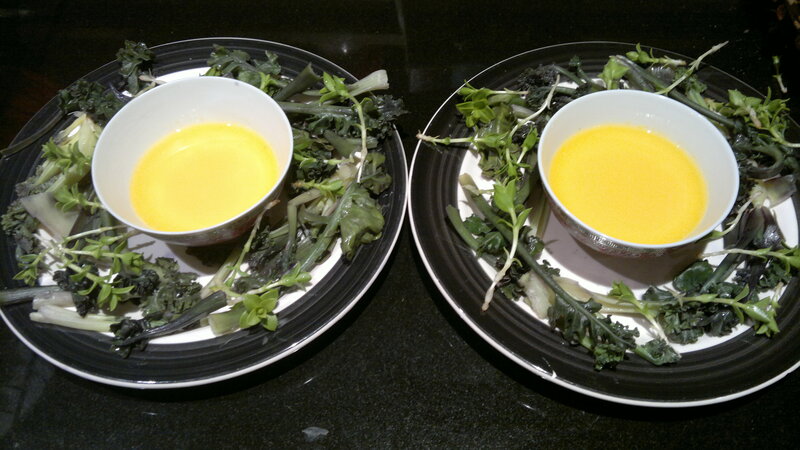 I mention the blanching of the stalks in the article. Later in the year, many of the stalks “self-blanche” among the shade of the earlier foliage. Well worth a rummage! I think I may have some growing on the allotment. I grew it from some chunks of root that someone gave me. The leaves look almost identical in shape and colour to the ones in the picture, but it hasn’t flowered. 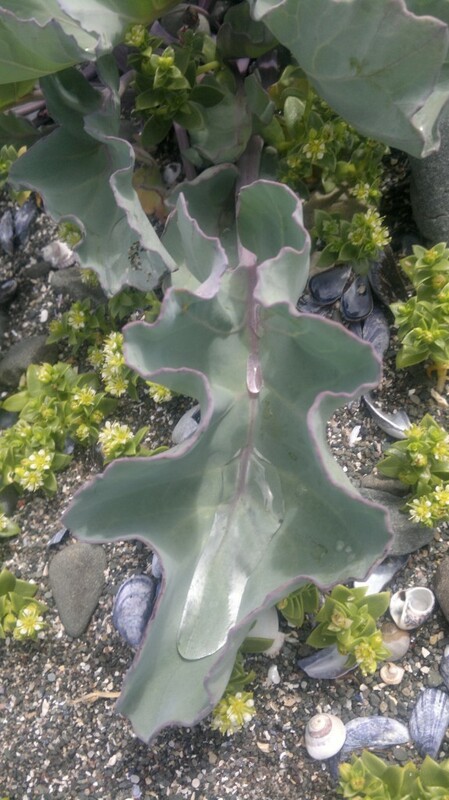 I’ve read that it can be confused with sea kale cabbage, but I’ve yet to find any descriptions/pictures that can help with a positive ID. Sea kale will regrow from pieces of root stock. 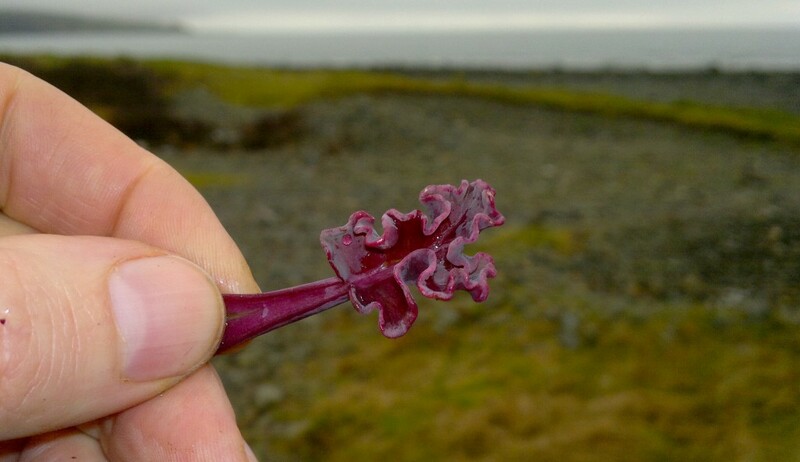 Wild cabbage is different, developing over time, a long, woody stem. Both are good eating.